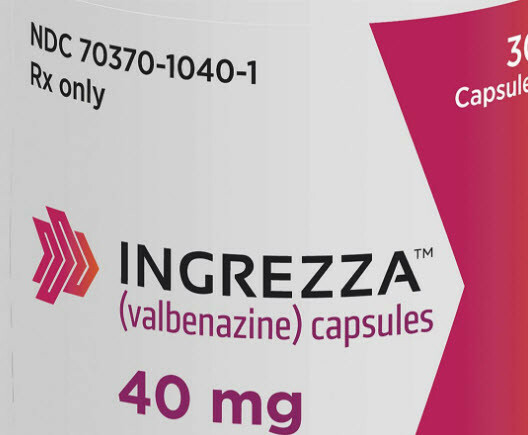 The FDA just approved a new drug, valbenazine, for tardive dyskinesia. Until now there have been few treatment options (vitamin E is sometimes helpful) and the most common choice patients and doctors had to make was to reduce the dose of the atypical antipsychotic that caused the tardive dyskinesia, or switch to another medication, possibly leading to worsened psychiatric symptoms. Valbenazine (Ingrezza, Neurocrine Biosciences) acts by inhibiting the action of vesicular monoamine transporter 2. VMA2 is necessary for the action of monoamine neurotransmitters such as norepinephrine, dopamine, serotonin, histamine and melatonin. VMA2 packages these neurotransmitters into vesicles that are then released into the synaptic junction when triggered by depolarization of the neuron. 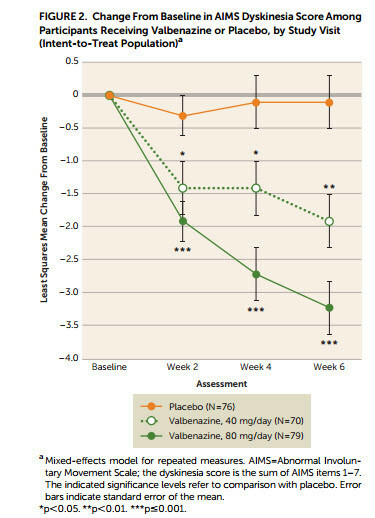 In a study published in the American Journal of Psychiatry, improvement in symptoms of tardive dyskinesia with valbenazine was substantial, and continued to increase throughout the six weeks of the clinical trial suggesting that longer-term use might be associated with an even greater improvement in symptoms. 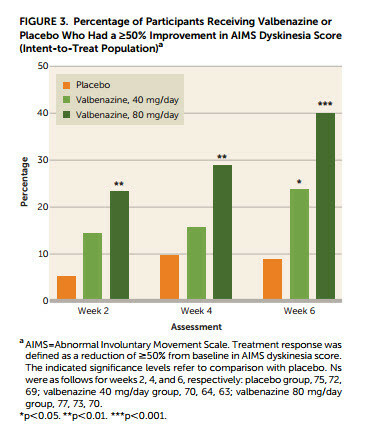 At the highest dose (80 mg) almost half of patients had a 50% reduction in symptoms of tardive dyskinesia by week six. Two important questions remain: what will this drug cost and what are the long term effects of the medication. In terms of long term effects, it is worth noting that other drugs that function by a similar mechanism include tetrabenzine and reserpine. These medications are associated with a significant risk of increased depression. In the short term (six weeks) study that led to approval of valbenazine there was no worsening in symptoms in patients with mood disorders. However longer term studies will be necessary to understand the potential adverse effects of this medication. So, the second part of the story from the market analyst’s perspective is that the FDA did not require any boxed warning about risks. Whether that will turn out to be the right decision or not we won’t know for a while.